A couple of weeks a go, my routine email checking became a lot more exciting. Waiting in my inbox was an email with a subject line that that jumped out grabbed my attention as though someone was pulling my shirt by the collar. 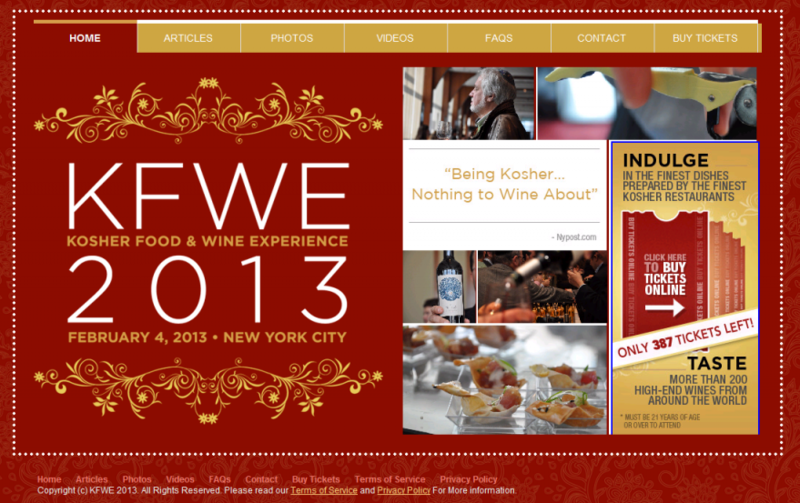 Kosher Food & Wine Experience 2013 – Exclusive Press Invitation. Instantly, I was excited at the thought of tasting dishes prepared by some of New York's finest restaurateurs and caterers, sampling from more than 200 exhibited wines, and getting to meet some of the food writers that I have connected with since This American Bite was born. Then reality set in. I live in the Mid West, we have children, I'd have to take time away from the office. My instant excitement was extinguished and I discounted the possibility of attending KFWE. 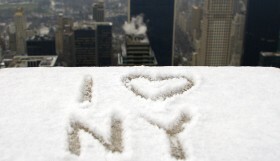 I forwarded the invitation to my wife with a simple note – Sometimes it would be nice to be on the East Coast. Her response? "Why don't you look for a flight?" I'm going to New York for the Kosher Food and Wine Experience! Hosted by Royal Wines, KFWE has developed a reputation for being a showcase for New York's most sophisticated culinary professionals and a must-attend show for kosher vineyards from the US and abroad. 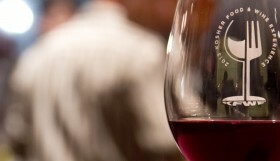 Last year, the event in New York was attended by more than 1200 who had the chance to taste wines from 40 wineries. Last year, California's Herzog Winery and Israel's Binyamina Winery both debuted new wines, and this is a show attended by winemakers themselves. Sister events are held in London and Los Angeles too. Although I primarily write about food, I certainly appreciate wine. The wine fridge I was gifted for my birthday last year sits proudly in the dining room and is filled with bottles from vineyards I have visited including Ella Valley, Tzorah and my favorite domestic winery, Hagafen Cellars and I love to browse the shelves of boutique wineries and wine stores. When we lived in Israel my wife and I would spend every Friday morning in Jerusalem's outdoor shuk (market) and visit our "wine guy". When we move to an apartment in a different neighborhood, we found a different wine boutique at the end of our block, and when we visit family in LA, we get a taste of that wine-store experience that we miss, but living in the Mid-West my wine is shipped to me. As a side note, have spoken fondly of JWines.com a number of times and they continue to offer me a wonderful buying experience through their website. If you want to introduce yourself to a broader selection of wines, they have three wine clubs too. I feel that This American Bite has helps to expose the ease and comfort with which you can live a kosher life in Overland Park, KS and cities just like it. We might not have the critical mass of kosher food and wine aficionados needed for an event like KFWE but that is ok, most cities don't, and we never go hungry. The food part of KFEW2013 is simply mind-blowing. It's been a decade since I was last in New York City and the scope of kosher food options takes my breath away. Yeah That's Kosher has a map of Kosher Mid Town and I am sure plenty of these restaurateurs will be at the event too. I don't know where to begin! On my return, you can expect a post about the highlights from KFWE and my trip. Other than friends, food and wine, I have one more "to-do" for my trip. I have never been to Central Park and that is going to change. Just a few weeks ago, I wrote 100th post. This American Bite has become a member of our family – I cook for it, I take photos for it, and it has a schedule that needs to be considered. I can't remember life-before-blog and my wife (who blogs at This American Mama) couldn't be more supportive of me taking this trip. I would not have received an invitation to this event if not for all of you who read, share, and give me feedback on This American Bite. I love writing for you, and I thank you all for your ongoing support. Will you be at KFWE? I'd love to meet you. This American Bite has been nominated for an award in the “Best Kosher Food Blog” category in the “Best of Kosher” awards by Joy of Kosher. You can vote for This American Bite daily until February 8, 2013! Enter today and every day until January 22, 2013 to with organic, grass feed and kosher lamb just like the roast I used in my Lamb Wellington recipe.